The morning I passed over the Spa Creek Bridge and entered Annapolis, Maryland, I was greeted with a sign that read “Annapolis: America’s Sailing Capital.” I snickered and promptly ignored it, but I couldn’t help but think of sailing’s influence on both Annapolis and Beneteau, the French boatbuilder of the Flyer 12 that I was slated to sea trial. Sandwiched between the busy ports of Baltimore and Washington, D.C., on Chesapeake Bay, Annapolis has been a sailing destination since the 18th century. In the 20th century, as technology provided alternatives to sail, the town became a popular stop along the Chesapeake for powerboaters. 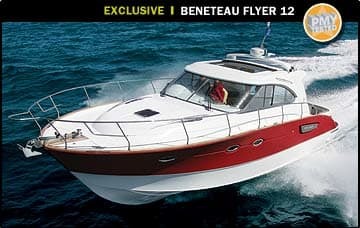 In 1908—about the same time these boats began popping up around Annapolis—Beneteau launched a line of powerboats after having built only sailboats for 25 years. So to some degree both city and builder owe a debt to sailing. Yet today both exhibit the full-steam-ahead attitude we powerboaters love. This is evidenced by the myriad naval vessels performing exercises in the waters around the academy and several diesel-powered Beneteau cruisers tightly bunched on a floating dock just outside downtown Annapolis. 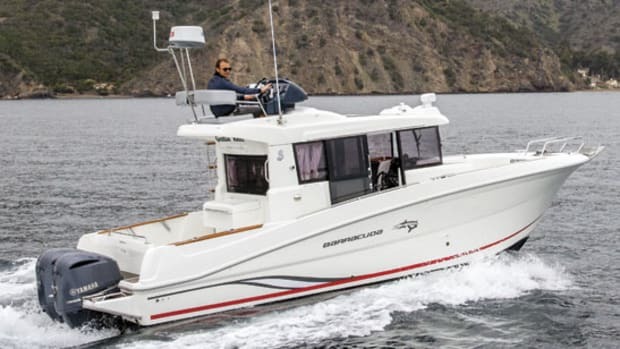 Beneteau is best known for its flying-bridge Antares models, as well as its 42-foot Swift Trawler, and when I spotted the Flyer 12 among her siblings, she struck quite a profile. 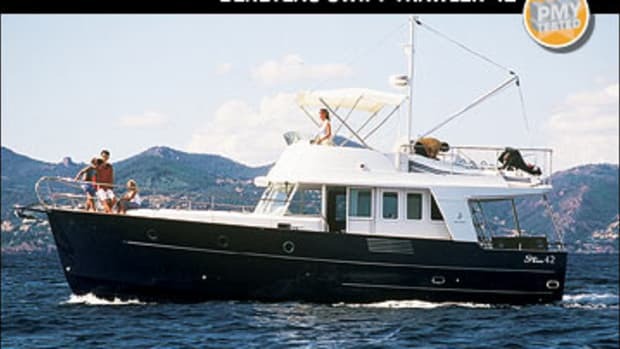 Her ruby-red hull certainly helped, the color a fine complement to the optional teak-clad swim platform. A man stepped from the saloon and introduced himself as Laurent Fabre as I boarded through the sliding transom door. He looked the part of the quintessential European yachtsman: tall, deeply tanned, and sporting sunglasses and a ripstop nylon shell, both of which looked like they’d come from a shop on the Cote d’Azur. I also spied a yachting chronograph on his wrist with more features than my PDA. Turned out Fabre was the right guy to have aboard. 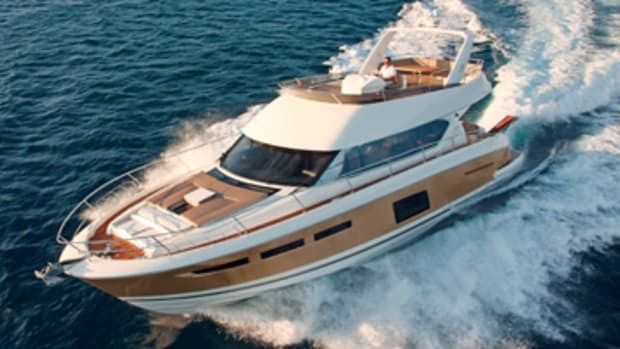 As Beneteau’s director of project management, he oversaw the collaboration between the builder and Volvo Penta, whose IPS system powers the Flyer and therefore was a major consideration in her hull design. While her entry deadrise is a secret, Fabre did disclose other details of the Patrick Sarrazin design, such as the fact that her hull has a variable deadrise, with the aftmost seven feet being nearly flat to accommodate the IPS drives. 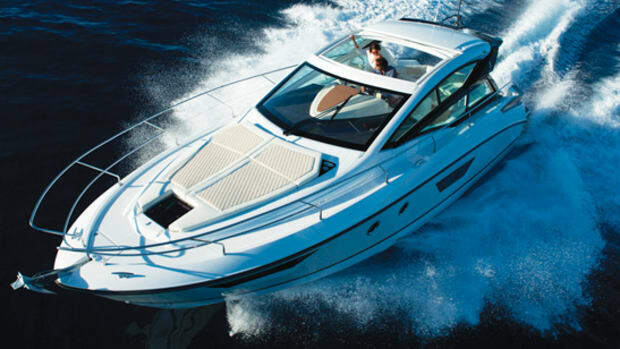 According to Fabre, the hull was tested and tweaked in Beneteau’s own test tank extensively over nine months. 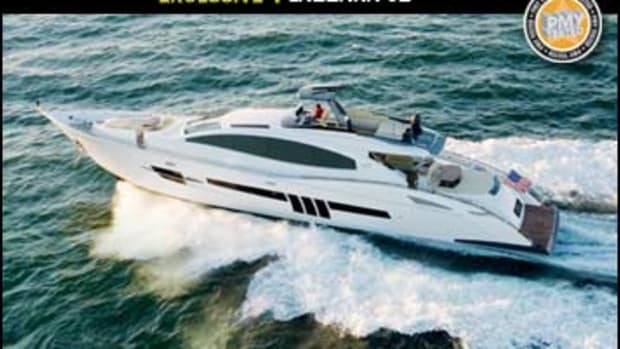 Volvo Penta spent years developing IPS, and it shines on the Flyer, thanks to her hull form. We reached an average top speed of 38.9 mph on a calm Severn River, and she came fully around at top speed in just over two boat lengths, with little loss in rpm. But what really surprised me was her efficiency: She managed 1 mpg or better throughout her rpm range. At her cruise speed of 28 mph and 2750 rpm, the Flyer burned 19.8 gph—that’s good for a range of more than 400 miles. But while her hull design is new, the Flyer’s built like the aforementioned sisterships. 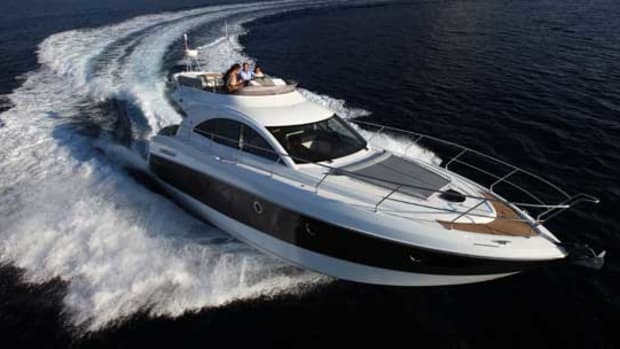 She utilizes a polyester balsa sandwich core below the waterline with single-skin, fiberglass topsides. Decks are also balsa sandwich coring, chosen for its favorable strength-to-weight ratio and sound attenuation, apparently with good reason, as during my sea trial, I measured just 78 d-BA at the helm at 30.6 mph and 3000 rpm (65 d-BA is the level of normal conversation). 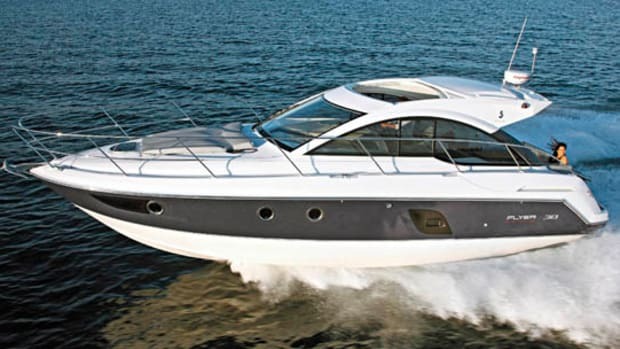 Two other reasons are the fact that the IPS 400 diesel inboards are well aft and the Flyer’s stainless steel sliding door to the cockpit was closed. The sound levels are even more impressive when you consider that the 4&apos;2"x 5&apos;5" electrically retractable fiberglass roof was open. 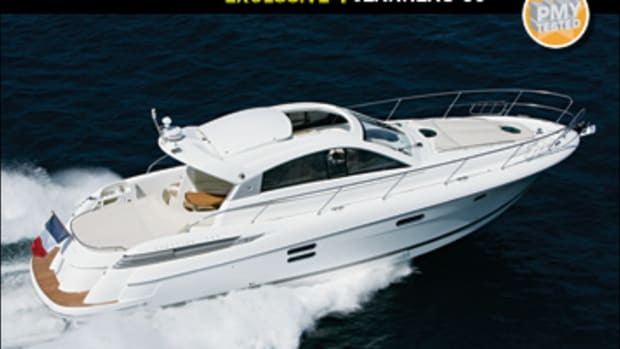 The Flyer’s sunroof is the piece de rsistance in a cleanly laid-out saloon that allows guests seated at the starboard C-shape settee to enjoy cool breezes and abundant sunlight. Even with it closed, there’s excellent cross-ventilation from sliding windows on both sides. 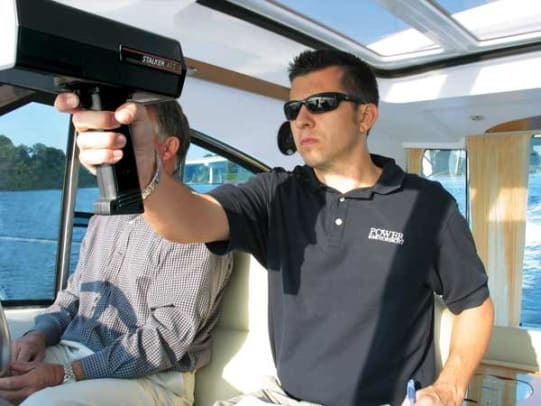 My test boat’s helm, just forward of the settee, was well stocked with the IPS instrument package, plus an optional Raymarine’s C120 chartplotter (the E120 is standard), Plastimo Offshore compass, and, most notably, Volvo Penta’s QL trim tab system, which boasts some of the clearest controls I’ve seen. In contrast to the helm’s modern electronics, the clean, utilitarian saloon reminded me of a sailboat’s spartan interior. According to Fabre, its exotic moabi wood was chosen because of its toughness and malleability. And while the joinery is first rate, it was the honey-toned color and spot-on grain match that impressed me. I particularly liked its use in the port-side hideaway galley. When closed, the galley can be a staging area for cockpit goings-on or a catch-all surface for towels, charts, etc. When opened, it’s a simple galley, with a small, split stainless steel sink and two-burner EuroKera cooktop. Below counter level, a Panasonic microwave/convection oven and Waeco ’fridge complete the amenities. The two drawers were shallow, but they were fitted for plates and glasses, and cruisers should be able to fit enough in for a long, three-day weekend. Although the large lazarette—it’s the space the optional straight-drive inboards occupy if the buyer opts not to choose IPS drives—is an option for nonperishable items, I would like to have seen more stowage here. 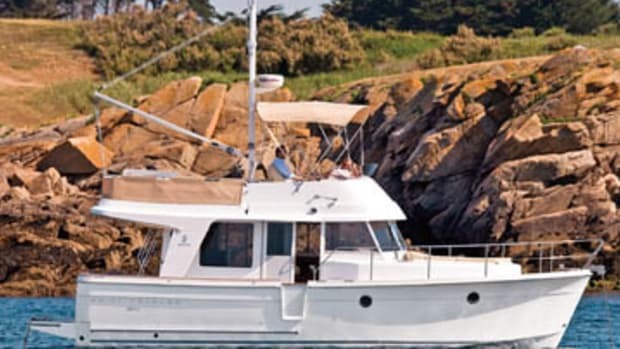 Below decks, Beneteau chose a two-stateroom layout, and while the forepeak master and starboard VIP are smaller than on some boats I’ve seen with similar LOA, the difference is that these each have en suite heads. Both have slick, smoke-blue shower doors, bowl-style wash basins, and 6&apos;4" headroom—the master shower has 6&apos;7" headroom and is big enough for two. Leaving the yard, I weaved my way through hundreds of sailboats that were at dry dock being prepared for winterization. I remembered the sign I’d seen on my way into town, honoring Annapolis’ past, and I imagined the Flyer 12 and her IPS drive a worthy portent of Annapolis’ future, speeding past the sailors on the Severn River.